No matter how often you ride you should give your bike a tune-up at least once a year. Today we’ll learn how to tune up your bike, which I’d recommend doing at least once a year, or even every few months if you ride every day. Since I can’t demonstrate every step of the procedure while keeping this video short, I’ll give a general overview and cover each step further in separate tutorials. You’ll notice below that I’ve written out all of the steps and included links to related tutorials. I’ll be adding new links as future videos are uploaded. Dish soap, water and some rags. Chain oil and a light lubricant like Tri-Flow. An air pump and tire pressure gauge. A set of metric allen wrenches (4-8mm). A set of metric open-end wrenches (8-17mm). Two 13mm and two 15mm cone wrenches. A set of appropriate sized headset wrenches. A spoke wrench for wheel truing. A chain wear indicator – Alternate Method. A repair stand or some rope to hang your bike from the ceiling. First disconnect your brakes and remove both wheels. This makes it easier to clean the bike frame and tune-up the wheels. Clean between the sprockets of your freewheel or cassette using a rag or a proper cleaning tool. Using a dry rag, wipe down the hubs, spokes, and rims on both wheels. If they are difficult to clean dip your rag in some mildly soapy water and try again. Never use harsh cleaners or a water hose to clean your bike. Check both hub adjustments to make sure they aren’t loose and that they spin freely. Adjust or overhaul them as necessary. If you have a truing stand, deflate the tires and check the alignment and spoke tension of both wheels and adjust them as needed. Inflate both tires to the recommended pressure and set them aside. Now wipe down your entire bike frame and components. I usually start at the handlebar and work my way to the rear derailleur in order to keep my rag clean as long as possible. Again you can dampen your rag with soapy water if needed to loosen up any tough grime. Once clean it’s a good idea to carefully inspect the entire surface of your frame for any hairline cracks or damage. If you notice anything you should take it to your local shop right away for further assessment, as it can be dangerous to ride on a cracked frame. Inspect all of your components as well, paying particular attention to the brake and shift cables. If they are frayed or have damaged housings, now is the time to replace them. Now apply a few drops of some light lubricant to the inside of your cable housings and all of the pivot points on your brake and shift components. Avoid getting any oil on your brake pads, and wipe off any excess so that it doesn’t collect dirt. Here’s a video that demonstrates cable lubrication. Check the adjustment of both your headset and bottom bracket to make sure they aren’t loose and spin smoothly. Inspect all of your brake pad surfaces and carefully trim away any wear ridges with a razor blade. Resurface them with rough sandpaper to clean up road grime. You should replace the pads if they are worn past the indicator line, or if you can see metal poking through the surface. Watch the brake tutorials. Now check all of the bolts on your bike to make sure they’re tight, but be careful not to over-tighten. If they already feel tight enough don’t force them any tighter. 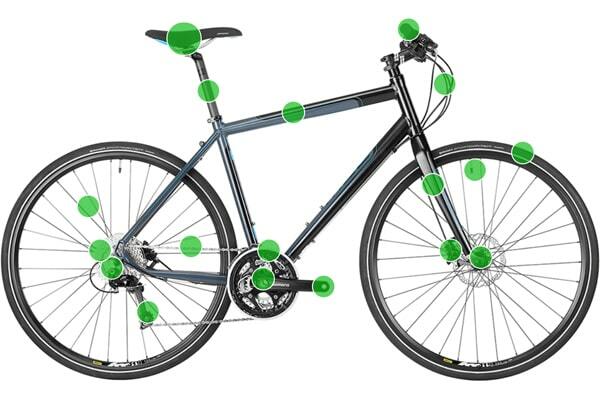 Important areas to check include your handlebars, levers, shifters, stem, seat, seatpost, brakes, derailleurs, cranks and pedals. Here is a bicycle torque specification guide from Park Tools. Now reinstall the wheels and reconnect your brakes. Adjust the brake pads and cable tension as needed. Clean the chain, check for chain wear, and then lubricate it with chain oil. Then adjust the rear derailleur first, and the front derailleur second. Now place the bike on the ground and adjust your handlebar and seat position if needed. The last step is very important. Take your bike on a thorough test ride, running through all of the gears and testing the brakes. Most of the time you’ll have a few minor re-adjustments to make before your bike is fully ready to ride.